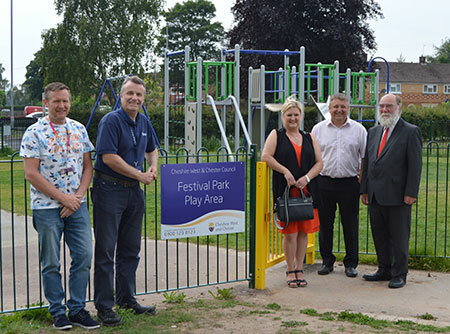 Over recent months Festival Park in Ellesmere Port has seen a variety of environmental improvements and more recently, the replacement of the children’s play equipment. Residents and park users have helped to plan and reshape the park making it a place where families feel safe to bring their children. Festival Park is an important park for the community with the improvements making it an enjoyable place to visit, play or just walk the dog. The work by Cheshire West and Chester Council followed concerns by residents and the Emergency Services over levels of anti-social behaviour including fly tipping, fires and the general condition of the play equipment. Councillor Karen Shore, Cabinet Member Environment and Mayor of Ellesmere Port said: “Working with the community we have taken significant steps in making the park a welcoming place where families now feel safe to take their children.